Lieutenant Colonel Tony Monetti (USAF Ret. 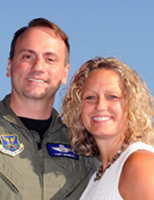 ), distinguished flying cross recipient, and B-2 Stealth Bomber pilot is a combat veteran command pilot who has written numerous articles for military publications. Penny Monetti is the author of Choose to Dance and speaks nationwide, presenting family-strengthening workshops. With twenty-three years of accrued experience, the Monettis and their three children know military life.